Option 1: you can use: http://www.httrack.com/ to copy the website. Option 2: If you are a GSuite user with a Spanning Backup license, you can also download one of the backups from Spanning, and open the .gz file with 7zip. This export includes all pages and documents on your GSite. OLD POST: If you need to backup or download the content of a Google Site, you can use the Google Sites liberation tool. 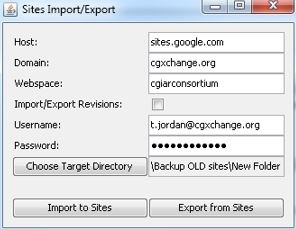 This tool allows any user in the CGXchange domain to backup their Google Sites locally on their Desktop. If you do not have permissions to install software on your computer, please ask your IT department for support.